LMN’s friend Rodrigo Peret OFM, of the Churches and Mining Network in Brazil, has sent us his own reflections on the incident. “Seven kilometers of rivers have been directly impacted by the rupture of the multi-national Anglo American pipeline since Monday (12/03). The Secretary of State and Environment (SEMAD) declares that the heaviest ore pulp materials are sedimented in the Santo Antônio Riverbed and a thinner layer of pulp in the Rio Casca bed. 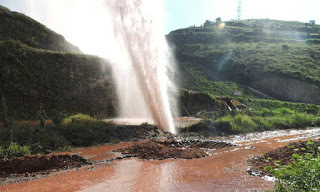 “What we know so far: 300 tons of ore have spouted, according to the company; Anglo American took 25 minutes to take an initiative; it took 11 hours to totally stop the pipe spill; more than 36 hours to help the population that was left without water and to start water distribution by truck kite, is still very precarious by themselves. “According to reports from MAM – Movement for Popular Sovereignty in Mining, the leak continues, as the water remains dirty, there is a lot of silting and destruction of river banks, with great impacts on biodiversity. MAM complain that Anglo American is shielding the area, preventing any approach to the surroundings. The same tactic used by Vale and BHP is repeated here, in the case of the rupture of the Samarco tailings dam. Those responsible for the disaster block and control the scene, preventing civil society from having any access. “The Public Prosecutor’s Office of Minas Gerais (MPMG) filed a public civil action, requesting the immediate blocking of R $ 10 million from Anglo American. The MPMG requires that the company stopthe leakage and the contamination immediately and that in 72 hours the containment, removal and subsequent disposal of the pollutants are completed. It also requires that Anglo American fully repair the damages to the environment and the health of the population that relies on the water. “MPMG also points out that adverse changes in environmental characteristics caused by disruption may, until proven otherwise, adversely affect the health, safety, and well-being of the population; create unfavorable conditions for social and economic activities; unfavorably affect biota; and affect the aesthetic or sanitary conditions of the environment. “Analysis of water samples taken by MPMG’s Nucleus of Environmental Crimes (Nucrim) attests that at upstream of the rupture site (approximately 100 m distance) there are 75.1 NTU (unit of turbidity), while, downstream (approximately 100 m distance), the measured value was 837 NTU. The Federal Public Prosecutor has instituted a civil investigation to determine the causes and consequences, as well as to establish responsibilities. Critics of this mining project have been subjected to frequent threats. Various United Nations bodies wrote to the Brazilian government last November expressing concern and calling for protection for the project’s critics. To date (19 March 2018) we are unaware of any answer from the Brazilian government.